Think about having a baby and one of the first pictures that pops into your head is a nappy. And then maybe a creeping sense of terror around what's in that nappy. You might have spent a lot of time around kids. You might have had friends or siblings with babies that you've played with or even helped feed. But odds are you never been called on to remove freshly-laid poo from out of their bum crack, and that's just the way you like it. It's fair to say that I didn't have a whole lot of time to prepare for the first nappy change. In fact apart from a bizarre 10 minutes in an NCT session with a nappy, a baby doll and some Nutella (which has put me off Nutella for a few years) I had zero experience until a midwife in the delivery room suggested that The Boy needed changing. 'Fair enough' I thought, having been through quite a lot that day, and nodded expectantly at her before the dawning realisation that she actually meant me. Now in one of nature's little tricks, the first poo your baby does is entirely different to anything else it will bestow on you. It even has it's own fun name - Meconium! And it's dark and sticky and a bit like Marmite (which is a real treat) as it contains a whole load of weird things your baby has been swallowing while in the womb. So with stoic British determination I got in there, gave that little newborn bum a hasty scrub with some wet cotton wool and got the hell out of there. Then under a fair amount of pressure from a watching audience I managed to put on a new nappy and tape it up at the sides with no major issues. Job done. King of nappy changes. High fives from all the top medical consultants (probably). But then it turns out that you're now expected to do this sort of thing all the time! And instead of getting easier it gets progressively worse! And all you really want to know is how to turn a dirty baby into a clean baby with as little exposure to baby poo as possible. Well it turns out that there are pro's and cons to newborn baby poo. On the plus side its initially a bit like curry sauce so it's relatively easy to wipe away. On the down side you'll be amazed by the sheer volume of poo a tiny baby can produce, and the foul smell it will generate. 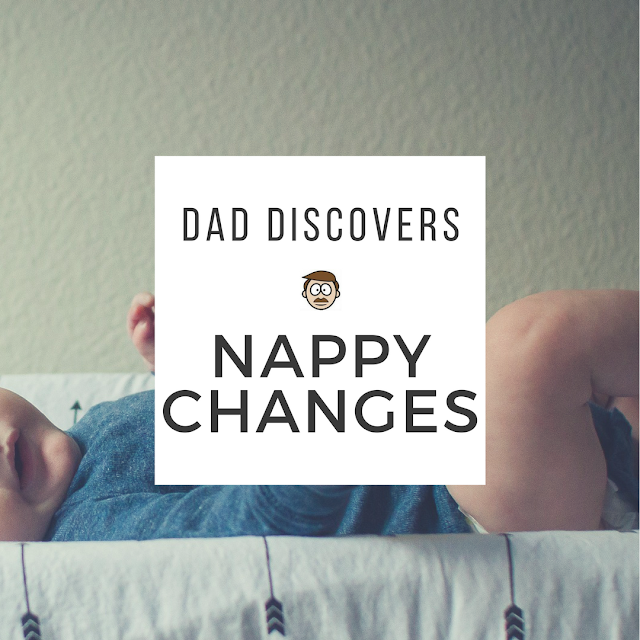 The nappies themselves though are relatively straight forward and mostly idiot-proof, and eventually, like most things, you'll get used to it and once again declare yourself King of Nappies. But then, in what you'll soon realise is an annoying habit of kids, they change their behaviour and everything you think you know will be rendered totally useless. One day they'll start kicking their legs about, then they'll start twisting their bodies away from you. Then they'll start trying to rummage around down there with their hands, and eventually they'll attempt an all-out escape while you're desperately trying to contain them with one hand while trying to contain the biological bomb that has gone off below with the other. You'll need wipes. You'll need a LOT of wipes. The Boy is only two at the moment so that's as far as I've gotten, but I'm certain there's a whole other chapter to be written about potty training and moving out of nappies altogether. I've been psychologically traumatised on more than one occasion, and will probably cover some of these greatest hits in another post, but I can say that I've done my duty for Queen and country, and if nothing else it has massively increased my tolerance for all other bodily fluids, which is nice. Good luck out there dads. May your nappies never leak, and may your wipes never run out.